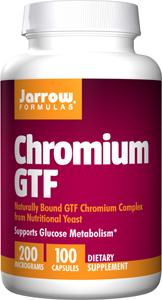 GTF Chromium is a complex known as Glucose Tolerance Factor and is made by fermenting nutritional yeast with chromium. GTF Chromium facilitates the transport of glucose into cells by insulin. Beneficial for sugar cravings and highly recommended for diabetics or those trying to lose weight, 1 capsule twice daily.